Its not always easy to do. Motivation while depressed is like trying to push an elephant. Today I’m feeling alright. It’s common for me to not leave the house for days. Isolation is on symptom of my depression. I also have PTSD. Today my niece has a volleyball game. I love watching her play. There’s a part of me that wants to go back to bed. Getting ready seems too big of a hurdle but I don’t want to disappoint her. The problem with depression is that you miss out on the living a lot. That’s one of my regrets dealing with depression. I know that recovery means pushing through the muck of depression. I really wish I had a paddle boat. Often I feel like I’m not advancing like others think I should. I move in slow motion. A friend once told me that even when you move like snail you’re still moving. So I’m thankful that I feel like going out into the world. Facing my fears one step at a time. Let’s be honest, depression bites. I mean if it was fun everyone would want to have it, right? There are few things in my life that’s remained constant and sadly depression is one of them. It’s an unwanted house guest who never leaves. I’ve blogged most of my adult life and a lot of my posts have been related to depression. There is so much stigma out there related to anything mental health related I felt it was important to share my daily battles with depression. My depression is crippling. I get the idea that many don’t understand (or don’t care) how much it affects my life. I know there are those who think I’m just lazy. If they could only living inside my mind for just one day they’d see that it’s not something I’m choosing. When I’m deeply depressed I feel down right awful both inside and out. Why would anyone inflict such torture onto themselves? Depression is like a snowball, the longer you let it roll down the hill the bigger it’s going to get. The battle with depression is that it not only affects you emotionally but physically as well. If you’ve sunk to the bottom of the depression well it’s going to take a lot of effort to get out and most likely you won’t have the energy to call out for help. Simple tasks like brushing your teeth becomes like climbing Mount Everest. Imagine having to make it through the day weighted down by heavy chains and being unable to remove them. That’s what it’s like. I’ve come to learn it’s about learning to maintain and cope with having depression, lately I’ve been struggling majorly. Logically one would think I would be on cloud nine being that I’ve just had my first art showing but that isn’t the case. Ever since I installed my artwork a few weeks ago I could feel that depression snowball build momentum. It was chipping away at everything good. It started out as little whispers eventually turning into lion roars that I wasn’t worthy of anything good. 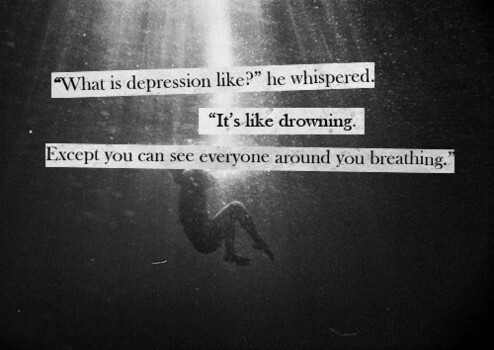 Depression is deceptive and sneaky. It’s that little devil on your shoulders instead he’s inside your mind poking his stick at your consciousnesses. Depression tells me I’m alone and that no one loves me. Depression doesn’t give up until it’s unplugged your cord from the outlet. Once you’re without power everything goes haywire. You’re disconnected from everything, especially the ones who love you. The question is how do you get off that broken record. If you’ve suffered from depression a long while you will understand what I mean. I find myself repeating the same things over and over, and being unable to stop. I find myself repeating things over and over, and being unable to stop. I find myself repeating things over and over, and being unable to stop. I find myself repeating things over and over, and being unable to stop… I think you get the point. Getting help is important and sometimes the hardest part of depression. Most of the time when you need help you are so battered and bruised that you can’t even voice the word help. Can you imagine being in a life and death situation where you are surrounded by people who can’t see that you’re in trouble and not being able to get help. The problem with depression is that many times the symptoms are masked. A prime example of this is Robin Williams. One of the funniest of all and inside he was dying and couldn’t tell a soul. For a moment imagine what it’s like to feel like you are dying and there is no cure. It’s not a fun place to be. I’ve been running that broken record for over twenty years and I’m tired. So very tired. I want to be happy but I start to wonder if it’s even possible or if I deserve it. Something has to give. I know I’m not alone. The National Institute of Mental Health stated that in 2012, an estimated 16 million adults aged 18 or older in the U.S. had at least one major depressive episode in the past year. I hope that by creating this blog I’m able to release some of this tension while helping others. If you know someone who suffers from depression reach out to them. Show them kindness. You don’t need to have the answers. Be there for them. Let them know that you’re on their side. All we need is a little love.